The snack food powerhouse deals with major international brands like Oreo, Nabisco, and Cadbury among others. As these brands prepare to reallocate their media budgets to mobile/digital platforms, Mondelez is choosing to partner with Facebook because of the platforms success at driving business growth and consumer engagement. Part of the contract is attributed to a strategic approach aimed at “understanding the ‘consumer journey’ and the ‘media touchpoints that can connect with that consumer.” Considering Facebook’s usefulness in measuring user analytics, the social platform will be a solid tool for keeping track of these trends. The company’s push towards social media also ties in Twitter and an “Oreo Trending Vending Machine” that allows users to create their own Oreo flavors based on hash tag trends. Followers can keep track of the conversation using #eatthetweet. Though this article does not identify how much or how long the contract has been signed for, it does mention that Mondelez is increasing “its North American mobile and digital spending from about a quarter of its media budget to more than half of all spending by 2016.” The contract is a clear indicator of how social media is impacting the marketing game. Though Facebook ads may not be effective in growing customer base, an active and amusing profile keeps the audience engaged and interested, in tune with product updates, and can be used to measure user analytics. 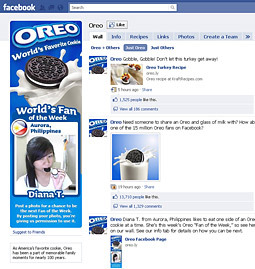 Mondelez International is just like every other business out there that wants to partner with FB. This is a great move from the to increase the awareness even more than it already is! I agree that it is a great move to increase awareness. If Facebook is in fact growing in the area of brand interaction, then it makes sense to place yourself competitively and really take advantage of all that the platform has to offer. This is only half the battle though. Mondelez International will only be successful through this tactic if they stay on top of things and stay creative with their content. I think it would be interesting to see how flexible these investments in specific partnerships with social media platforms will be. We’ve been discussing a lot in class about the prediction that the younger generations are going to start gravitating away from Facebook. It will be interesting to see how this effects companies that make Facebook their central marketing tool and how they cope if their target moves away from platforms they have heavily invested in. That’s a point I hadn’t thought of. Companies won’t be able to exploit Facebook as a simple (and cheap) tool to reach out to thousands/millions of young untapped audience. Now with an older generation filling in that space, I wonder what the next tool will be to keep in touch with a young audience. Facebook is a great business to partner up with. Facebook will allow for Mendelez International to get their name out there. This will improve their brand awareness if done properly. They will need to build enough followers and create a bigger audience in order for their awareness to increase. This is a great move though its moving their company in the right direction in the realms of social media. I don’t think Mondelez is as concerned with getting their name out there as they are with using new tools (some still in beta) to the greatest advantage of the brands they manage.